A City journalism academic has given a presentation about Muslim women in the media at an international workshop in Turkey. Dr Zahera Harb was a keynote speaker at the event in Ankara, titled The Role of Women in the Development of OIC Member States. The event was attended by senior officials from institutions in countries that are members of the Organisation of Islamic Cooperation (OIC). 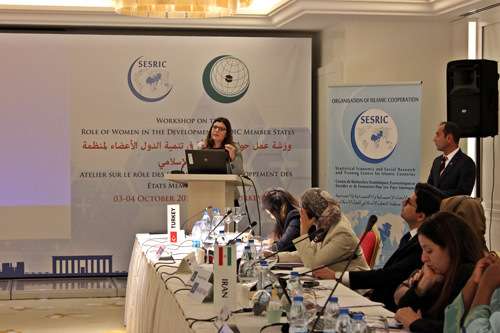 A Senior Lecturer in International Journalism, Dr Harb spoke of the importance of putting forward a set of guidelines to help women in the 57 OIC member states identify and counter hate speech or offensive language against them. The event was organised by the Statistical, Economic and Social Research and Training Centre for Islamic Countries (SESRIC), alongside the OIC. Dr Harb said: “In my presentation, I put forward a recommendation to the OIC General Secretariat to issue a set of guidelines that support positive representation of women in the media in OIC member states. “The guidelines would identify and counter hate speech against women, as well as discourses that cause harm and offence. A road map on what constitutes hate speech and what constitutes harm and offence would also be included. The guidelines might also be tied closely with the updated version of OPPAW, the OIC Plan of Action for the Advancement of Women in its member states. Dr Harb’s presentation was part of a wider discussion of issues related to the empowerment of women to enable them efficient participation in the development of Muslim societies. The discussions resulted in the creation of several concrete recommendations in support of OPPAW and its implementation. These will be presented during the Senior Official Meeting of the Sixth Session of the Ministerial Conference on the Role of Women in the Development of OIC Member States.